SPACES FOR CHANGE’s Ndutim Enang joined development practitioners and land rights advocates from all over Africa at the two-day international conference on LAND GOVERNANCE organized by the African Natural Resources Centre (ANRC) of the African Development Bank (AfDB) in Kenya. The conference held on November 23-24, 2016, responds to the growing interest in land tenure regularization by many African countries and their development partners. ANRC seized the opportunity to share the findings and recommendations of its commissioned case studies, guiding principles, guidelines and toolkits for enhancing the activities of national actors engaged in advocacy around land governance in the continent. In his opening remarks, James-Opio Omoding, Chief Rural/Agricultural Economist of the AfDB and the Centre’s lead on land policy research iterated that land policies and reforms should draw directly from a country’s vision and long term developmental goals. Along this line, a panel discussion on ‘Fairness and Equity in Land Access and Ownership in Africa’ with panelists from Nigeria, Malawi, Burkina Faso and Guinea shared country experiences regarding land policies and reforms, and the challenges within. Professor Peter Adeniyi, Chairperson on Nigerian Presidential Committee on Land Reforms highlighted the need for land policies within the country to be more evidence-based and inclusive. That means increased gender participation in the reform and restructuring of institutions that administer land is more imperative than ever before. Adjustments also need to be made in land titling and registration procedures to expand women’s access to land. Also important is the need for restorative measures to deal with inequalities inherent in land distribution. Guinea’s Bocar Thiam highlighted that 78% of Guinea’s population engage in agriculture. Studies show that customary laws were practiced more in the lower and Movenne Guinea . The country’s land code is extremely technical and and the provisions were largely influenced by the French Positive Law. A clearer definition of land ownership in the country’s land code is therefore necessary to strengthen coordination & cooperation between government ministries, and entrench inclusion in the policy formulations. Burkina Faso’s Ms. Blaise Yoda stated that the country’s agrarian code aimed to reform land tenure in the rural areas by vesting land ownership in the government and various users. It also recognizes traditional and customary landholdings. However, titling and registration processes–such as mapping–needs to be made more affordable in order to encourage equal participation in land governance. On the measures and approaches for strengthening land governance, panelists presented case studies that showcased transparency and accountability in land transactions by state and non-state actors. The case studies highlighted a number of best practices focusing on digitized and computerized registries, coordination between state ministries, cooperation with civil society organizations and other non-state actors, citizen engagement and inclusion in policy formulation, clear institutional mandates and institution of alternative dispute resolution (ADR) mechanism for the speedy resolution of land disputes. During the plenary session, participants were required to review, critique and further enrich the Centre’s draft “Guidelines For Gender in Land Tenure Reforms in Africa. The guidelines were drawn from studies showing that 75% of land in Africa falls under customary land systems and the majority of women do not own the lands they live and farm on. The guidelines are based on four types of land reforms: land redistribution, land restitution, tenural reform and land consolidation. 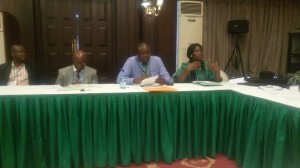 Ms. Enang participated in the group discussions on enhancing gender participation in land registration and titling. She elaborated on the need for the rights of women to land to be acknowledged, communicated and negotiated within the contexts of their local customs and in consonance with national law. She shared Spaces for Change’s experiences and documentations around the Abuja land swap initiative and the implications on the rights of women and indigenous land owners. She also discussed SPACES FOR CHANGE’s policy engagements around urban land reform, and increasing housing delivery to the urban poor. The group review reports presented at the end of the sessions hope to build on the shared best practices in order to manage the potential threats to the use, ownership and access rights of landholding communities, women and other vulnerable groups, more effectively.